Wrap the squash in foil and toss into the oven/toaster oven until soft–you want it to still have some shape though (30 mins). Alternately, you can microwave it. I put it in for 5 mins at a time, about 2 or 3 times. You don’t want it mushy–you want to be able to cut it into pieces. 2. In a heavy bottomed skillet, saute onion in some olive oil. Add garlic, ginger, tomato paste, jalapeno, sugar, water, sriracha, and cinnamon stick. Simmer while the pumpkin is cooking. The longer it simmers, the more flavorful it gets. 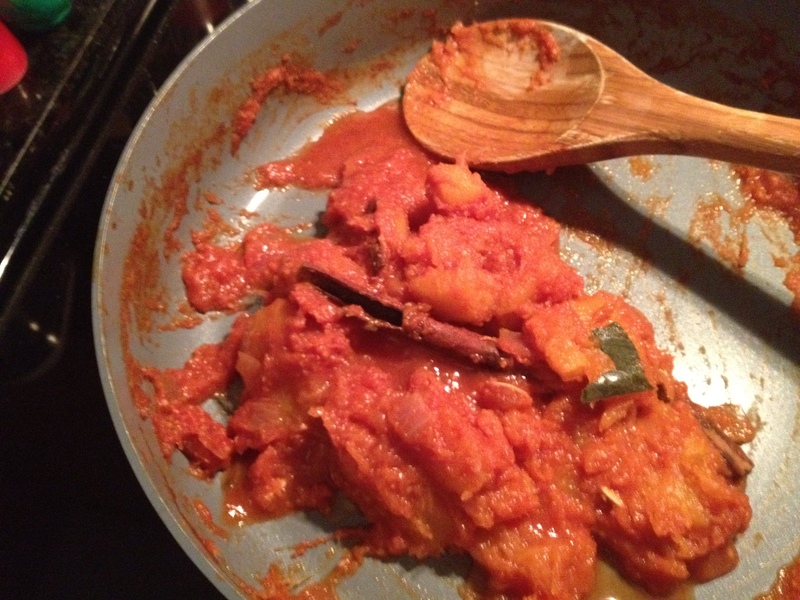 Chop the cooked squash into pieces and add that to the tomato mixture. Simmer for a little while longer. Before serving, blend together scallion, cilantro, a pinch of salt, cumin, berbere, and yogurt in the blender. Top pumpkin with a dab of the cilantro-yogurt sauce. 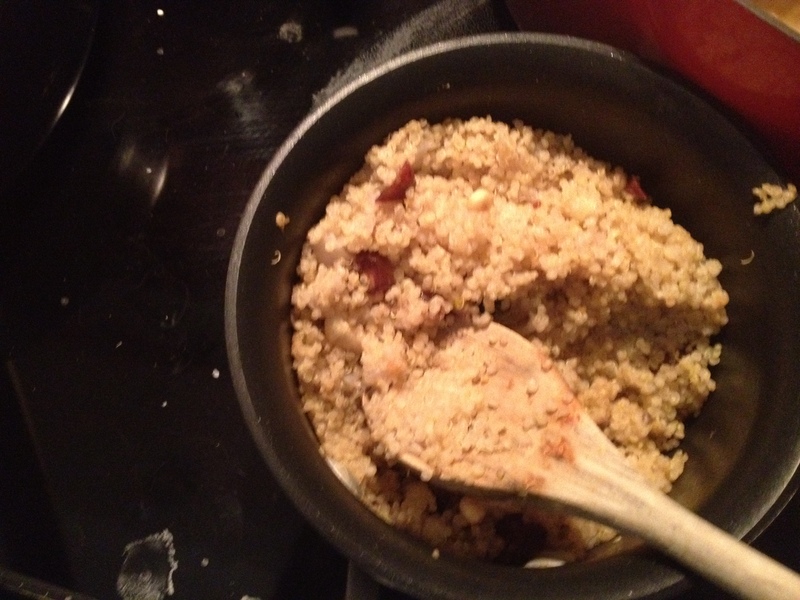 the Challow/Pulao (I said “rice” because I used quinoa instead). Why quiona? it’s quick. it’s “healthier” than rice. we like it. Saute the onion in a saucepan. Add the quiona and boiling water. Simmer. Add the cinnamon, cardamom, and star anise. Cook til it’s cooked and fluffy (and the water is absorbed). Saute the cashews, apricots, and dates in olive oil or a dab of butter til the nuts turn brown. add to the quiona and tada! This entry was posted in Recipes, Recipies and tagged acorn squash, afghan, CSA, spicy pumpkin. Bookmark the permalink.